The migration period, or barbarian invasions or Völkerwanderung, happened in AD 300–700 in Europe, at the end of ancient history and during the Early Middle Ages. 2nd to fifth century simplified migrations. See also map of the world in AD 820. 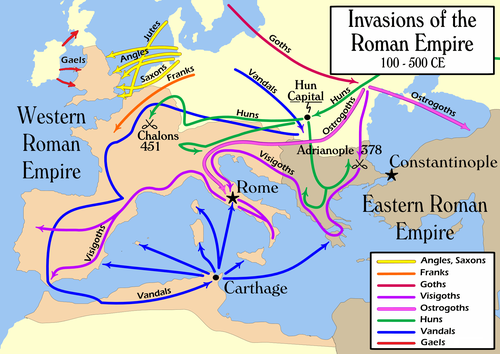 The migrations included the Goths, Vandals, Franks, and other Germanic, Bulgar, and Slavic tribes. They may have been influenced by attacks of the Huns in the East and may also be connected to the Turkic migrations in Central Asia, overpopulation, or climate changes. The migration period also included groups of Angles, Saxons, Frisians, and some Jutes to Britain. Migrations would continue well into the Middle Ages, beyond 1000 AD, with successive waves of Slavs, Alans, Avars, Bulgars, Hungarians, Pechenegs, Cumans, and Tatars that changed the ethnic makeup of Eastern Europe. Western European historians, however, tend to stress the migrations that were most relevant to Western Europe. ↑ Precise dates given may vary; ones that are often cited are 410, the sack of Rome by Alaric I, or 751, the accession of Pippin the Short and the establishment of the Carolingian dynasty. ↑ Climate change and human mobility: challenges to the social sciences, eds. Kirsten Hastrup, Karen Fog Olwig (Cambridge; New York: Cambridge University Press, 2012), p. 29. This page was last changed on 11 October 2018, at 17:04.